I am probably like a lot of readers and thought that driven pheasant shooting was for pansies and fops. I’ll get to the get up later. If you have never experienced a driven pheasant shoot then you don’t know what you are missing. I was lucky enough to be invited to a driven shoot at Tuna Nui in the Hawkes Bay. 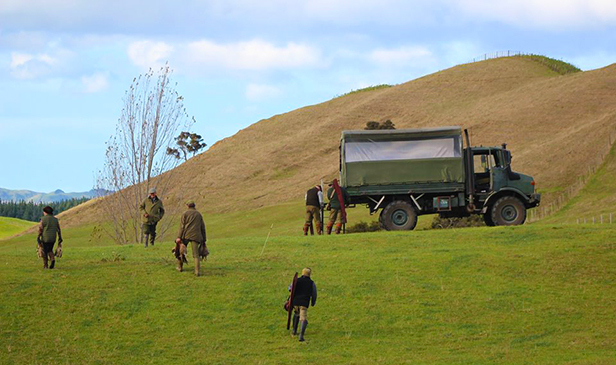 Tuna Nui Station, at the foot of the Kaweka Ranges in Hawke’s Bay offers driven pheasant shooting during the gamebird hunting season – from May until the end of August. 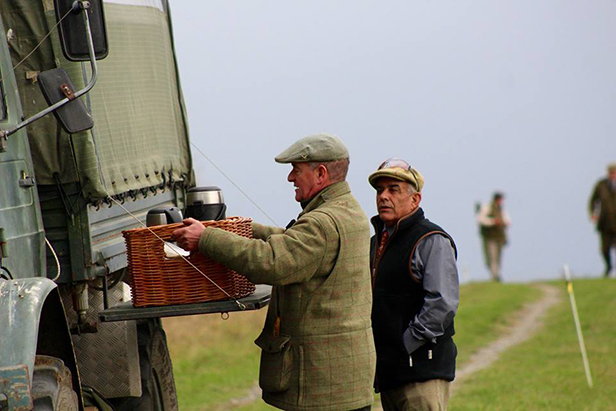 A team of guns is comprised of 8-9 people and we offer bags of 150-250 pheasants. We often have availability for individuals or smaller numbers wishing to join a team. We are happy to arrange consecutive days with other reputable shoots in Hawke’s Bay and beyond. 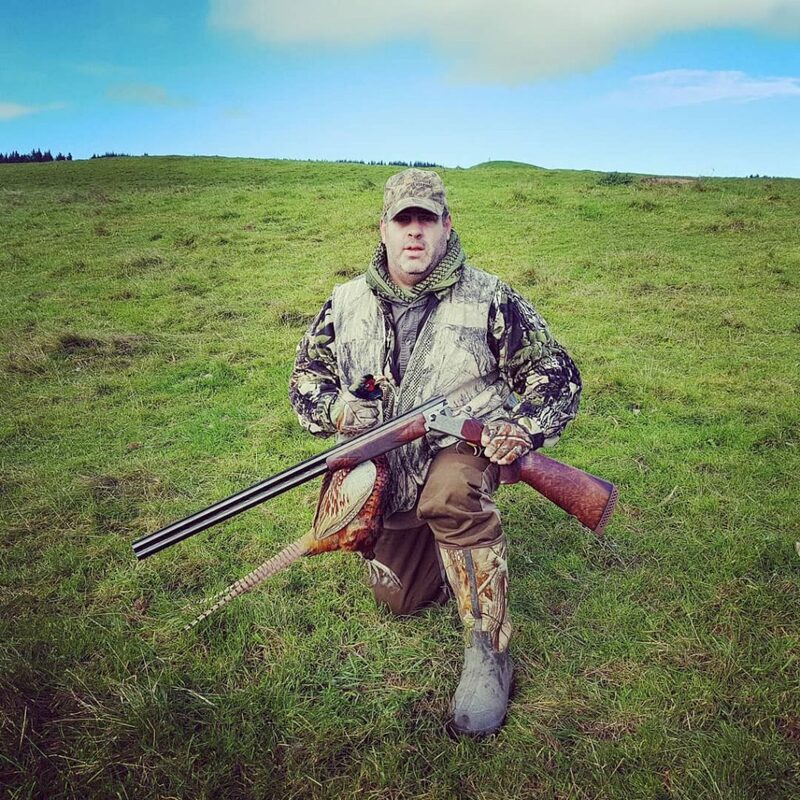 At Tuna Nui Gamebirds our aim is to provide challenging shooting for all abilities. The variation in terrain and tree planting is conducive to slowing the flushed pheasants – we like to have the guns on their pegs for as long as possible in order to enjoy the variety of birds presented to them. 8.30am We meet for coffee and a shoot briefing at the iconic Tuna Nui woolshed. You will meet your hosts for the day (Andrew and Pip Russell, and Jeff Niblett) and draw pegs. 12.30pm Lunch at the woolshed for Guns and all shoot helpers is casual but substantial. You will have a chance to mingle with our shoot helpers, over a shared lunch. 4pm Drinks, nibbles and tales of tall birds to be shared at the historic Tuna Nui Homestead. Your hosts Andrew and Pip Russell, and Jeff Nilbett look forward to sharing some refreshments back at the house. Oft served include NZ mussels from the BBQ, pheasant wantons with a spicey chilly dip, crumbed pheasant strips with cumberland dipping sauce, stilton cheese with locally preserved figs on locally made oatcakes. Wash it down with a a glass of fine Hawkes Bay wine. At Tuna Nui our small and dedicated team work together to ensure that you have a variety of challenging birds for shooting. Good food and great company, in a casual and relaxed atmosphere will round off a memorable days shooting at Tuna Nui. It is an amazing experience and stunning to watch dogs work and the technical aspects of putting birds onto the gun line by the gamekeeper and his team of beaters. You might think that shooting driven pheasants is easy. Let me assure it isn’t. I was shooting with some very experienced guns and they were missing plenty. It is said that the usual ratio is 5 shots for every bird. It is expected that for your team to put down 200 birds that the team will fire at least 1000 shots. This is of course why it is so much fun, there is lots of trigger action. The birds come from all angles, and often are stratospheric which makes nailing a high bird that much more impressive. They are fast too, they’ve been spooked, and got a wriggle on by the time they are approaching the peg line. Still there is nothing more satisfying than dropping a bird with a good hard shot. Watching them fold up and drop nearby is a real pleasure. This was my first time doing driven birds and I enjoyed it immensely. There is a real camaraderie on the “bus” amongst the guns and no one is taking themselves too seriously. Everyone is willing to offer advice to newbies and there are no pretentions despite the pretentious looking clothing. The “bus”, a good old Unimog to cart the guns around. About that. I used to think the clothing worn at driven shoots was a poncy and for pooftahs. Not anymore. There is a reason you wear breeks, and the tight fighting wool clothing. The breeks are more comfortable to wear than trousers because you are mostly wearing gumboots and tucking trousers into those is uncomfortable after long hours on the pegs. Having form fitting clothing allows better and easier mounting of the gun at some very awkward angles. Then there is keeping warm. You need clothing that will stop the wind chilling you to the bone but without the bulk usually associated with such clothing. That is where the wool tweeds come in. They stop the wind, keep you warm and allow fast mounting of the gun for those difficult shots. Driven bird shooting is a whole heap of fun and even better with a fine weapon like my new Miroku MK10 Sporter from Reloaders. Check back soon for a review of this gun. Save up you money, and go an enjoy at least one driven pheasant shoot in your hunting life. It is well worth it to experience shooting like this. Give the folks at Tuna Nui a call and book a shoot, but be quick there are limited spaces available.